When we purchased our New Mercury Marine 8' Dinghy at the Miami Boat Show a few years ago, the Mercury Dealer (in New York) sent us a plasticized canvas cover. To be blunt, it was a POS, but it did serve to keep the dinghy out of the UV when inverted on our foredeck, which is where we keep it all of the time when it's out of the water! Over the New Year's Eve Cruise with our sailing club (Here's a link HISC), the cover disintegrated! It literally tore to shreds. Time for a new cover. 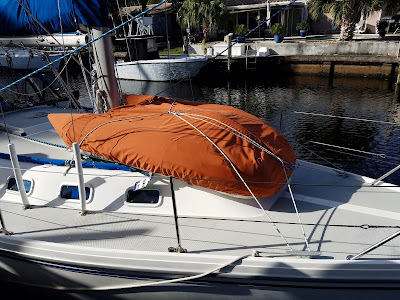 I had some Sunbrella available, not the same color as the rest of the boat canvas, but neither is our Helm cover! So we started the project. Step 1 was to make a template, I use Dura Skim from Sailrite for the more complex canvas tasks, but this was comparatively simple (Ha!) so I used Builders Tyvek wrap (purchased a 3' x 100' roll last year). Because the dink is pretty symmetrical along the keel, I only made a template of one side. There parts to the template. Stbd Side, Stbd Cone and Transom, I cut the Side and Cone pieces, inverted them and cut the Port side and cone from those, then cut the Transom piece. After joining the two large pieces with a Counter Seam, next the Cones were added to the back end. 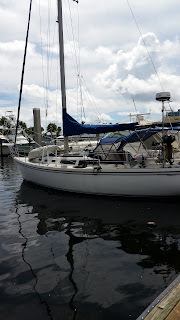 At that point I took the canvas to the boat and did a trial fit, marking out the transom piece connection and the lower hem all the way around the dinghy. Back home, attached the Transom piece too the cones and back of the main pieces with a Mock French Seam. Finally, trimmed the bottom edge to the marked line with a 2" seam allowance and then machine sewed the hem with a 6' piece of 1/4" Shock cord inside the hem, secured at the front centerline and the aft end where the hem included the Cones. Back to the boat and here's the result. Fits like a glove, the shock cord nicely pulls the lower edge beneath the Dinghy's rub rail to keep the cover secure. It's time to make a new securing line to hold the covered dink to the deck, the old lines are getting tacky. It looks a bit Baggy in this photo, but the dink has not been inflated since Dec 31st.